1. 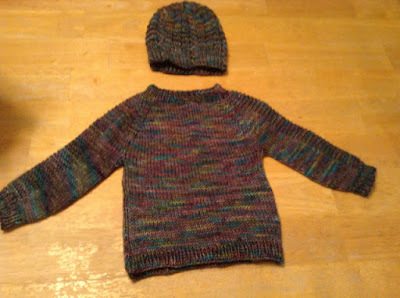 Baby sweaters are oddly satisfying to knit and a great thing to accumulate in your box of future gifts. You know, just in case. 2. 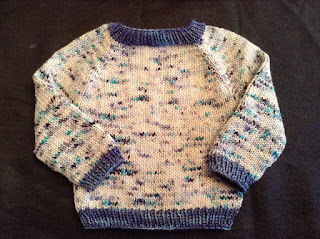 I know it takes time to build both a baby and a baby sweater and it is only rarely that either one surprises you with its immediate and unexpected arrival. So it is best to be prepared ahead of time. 3. Some parents are reluctant to specify the gender of their baby; if they know at all. 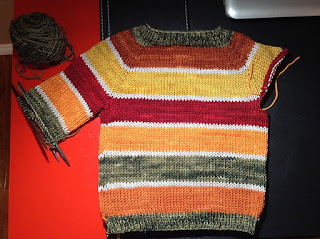 So I am prepared and make them in all 3 genders: solid, variegated and striped. This one is now finished! 4. 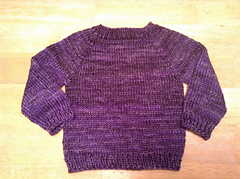 I try to have at least 3 baby sweaters made and ready for immediate gifting at all times. 5. I'm pretty sure I need some new friends because they all proclaim they are done having babies. 6. Due to my friends reluctance to give me someone to knit for and my own children's insistence at being NOT babies and having their father's ridiculously long arms I've resorted to gifting baby sweaters to neighbours, co-workers, grandchildren of co-workers and assorted strangers. Orange you glad it's another Flax? 7. Recipients very rarely understand or acknowledge the gift as being hand made without being told. I honestly can't tell if that is compliment or not. In my specific case this may or may not be the result of a new parent being presented a gift from an essential stranger. 8. Yes, it is highly self absorbed to make direct and prolonged eye contact with the new parent while telling them repeatedly that the gift was hand made. By me. With my own hands. And it took a long time. 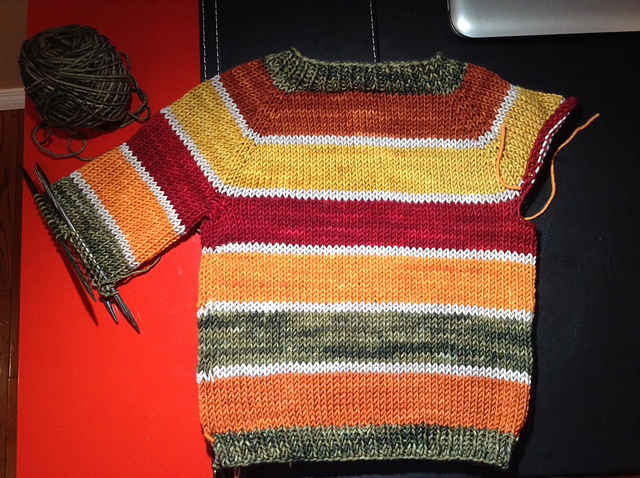 On small needles. And I did that because I like you/ live near you/ work with you or someone you know/ have only just met you and see that you have an infant. 9. And unless the new parents have a "maker" somewhere in their family tree they still won't really understand. And that's O.K. Either learn to not take it personally or buy commercially made gifts. 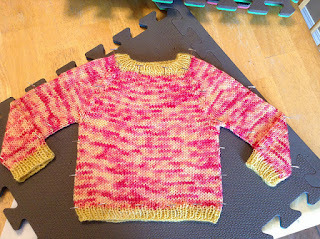 Get over yourself- you've just made a sweater. They made the baby. Between the two yours really is the lesser accomplishment. 9.5. 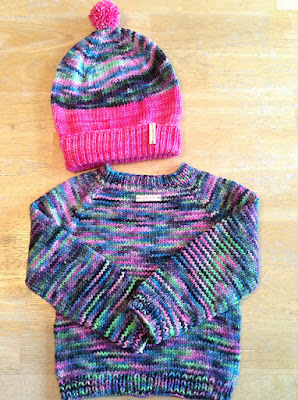 Unless you gifted a full Fair Isle sweater and then you totally win! Double win if it is in sticky Shetland wool! Triple win if you worked your colour work with both hands and had more than 2 colours per row. 10. But, seriously, if you did that then you need to question your life choices and your understanding of how babies work. (Spoiler alert: at some point this kid will squirt poop so far up its own back that their shoulder blades will be squishy. #the struggleisreal.) 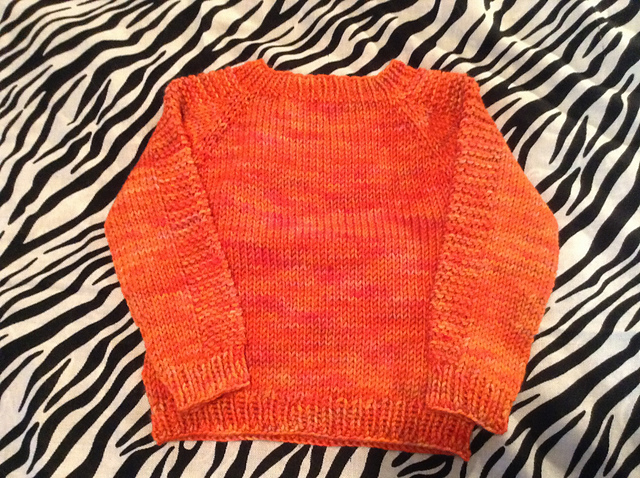 Baby sweaters should be as washable as the baby. Babies are complex enough creatures to figure out- we do not need to level up on difficulty with elaborate washing instructions. 11. Babies are ALWAYS knit-worthy... even if their parents aren't.